Kidlandlee is now a sprinkling of old outbuildings high in the Northumberland moors 3 miles north of Alwinton – some of them having been redeveloped, others are in the process of being brought back to life. But the substantial, and now long-gone, building you see above was once the centre-point of the remote estate. It was known simply as Kidland, or Kidlandlee, and, though it looks like a mansion, it was, in fact, merely a shooting lodge. 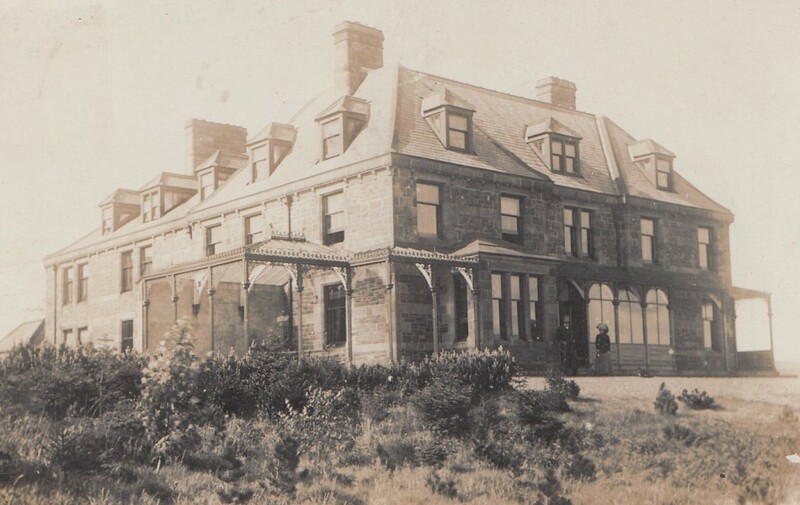 In its Edwardian heyday, Kidlandlee was the highest ‘mansion’ in England at almost 1,300ft. It was constructed in the 1890s by Christopher J.Leyland, whose prime residence was Haggerston Castle a little south of Berwick. Leyland was an inveterate builder of big things and lavished his wealth on both his main home and this incredible recreational lodge in the foothills of the Cheviots. Some say that the construction of the lofty lodge was the result of a bet to build the highest mansion in the land! Having bought the plot from the Hon F.W.Lambton, he set about building his little summer house – which ultimately was to consist of two halls, dining room, drawing room, smoking room, 13 bedrooms and 6 bathrooms. Externally, there were several outbuildings together with a man-made lake and a croquet lawn. After Leyland’s passing in the mid-1920s, his son, hampered by crippling death duties, sold off much of his father’s estate, including the Kidlandlee mansion. It fell into the hands of the Lee family, but by 1950 it had become unmanageable and the decision was taken to demolish it. It was spectacularly destroyed in 1956 by explosives, leaving a few outbuildings intact. Around the same time planting began of the surrounding Kidland Forest, which now gives the spot an even remoter feel, it still only being accessible by forest tracks. Note: Leyland made a name for himself as the man behind the Leylandii tree (see here), and also as the captain of the pioneering steam turbine, Turbinia. 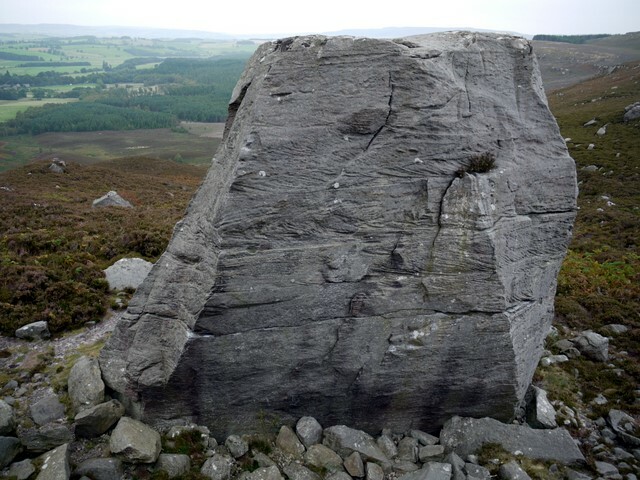 Less than a mile to the west of Harbottle a stone’s throw from the River Coquet, lies what is said to be the largest boulder in Northumberland. This huge object weighs in at an estimated 2,000 tons and stands 30ft in height. It has for centuries been known as The Drake Stone, though no one seems to quite know why! The sandstone giant bears scars (striations) of the last ice age, though it is referred to as an ‘erratic rock’, which means that it was carried to and dumped at its current location by a glacier. As you can imagine, it is visible for miles around from several angles. You will not be surprised to learn that in times gone by the stone was thought to have special powers, children being passed over the boulder to cure ailments. It has vague Druidic links, too (some sources give the name in this context as the Draag Stone). Additionally, there are many tales of young chaps seeking to prove their manliness by scaling the mini mountain – only to find that, in fact, the descent is a good deal harder than the ascent! The name ‘Drake Stone’ has puzzled historians for years. I can do little to add to the debate. For one thing, it seems unlikely to have anything to do with male ducks; though it is, perhaps, worth noting that the word ‘drake’ comes from the Latin draco, meaning ‘dragon’ (it may, I suppose, look like a fire-breathing monster with the sun setting behind it!). A recent theory suggests that the stone (in outline) bears a certain resemblance to an Elizabethan galleon – so it may be named after Queen Bess’s favourite seafarer, Sir Francis Drake. In a cabinet in St.Cuthbert’s Church, Elsdon, can be found the skulls of three horses. 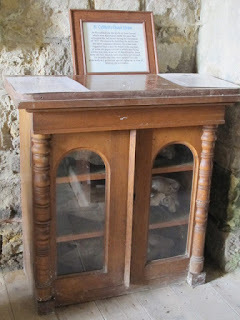 The items were found in the building’s stump of a spire during restoration work in 1877 – in a specially made, sealed chamber – and no one has been able to satisfactorily explain the bizarre discovery. It has been suggested that it may hark back to the ancient pagan ritual of sacrificing a horse, which was seen as a sanctifying action – perhaps originally during the construction of an early church on the spot. But as the church has been renovated several times over the centuries this would mean the survival of a very old tradition over a prolonged period. Elsdon, though, was a stopping off point for the body of St.Cuthbert on its wanderings in the late 9th century, so there may well be something in this story – namely, that the placing of the skulls was a sort of foundation sacrifice, which was then copied over the ages. Whatever the true story behind the horse skulls of Elsdon, we can be sure that their origins stretch back a long, long time. Though it is some time since Otterburn Mill was a working concern (it ceased operating in 1976), the establishment retains its fame here in the North-East as a popular tourist attraction. For the historically minded, though, it also has two rather neat claims to fame. You’ve heard of the phrase ‘on tenterhooks’, haven’t you? Well, the idiom, which means to be in a state of suspense, comes from the textile industry. You see, after a piece of cloth had been woven it had to be washed and dried – and this was done by hanging it on a contraption called a tenter frame, which consisted of upper and lower bars studded with hooks. The lower bar was left loose – in a state of suspension – to stretch the cloth whilst it dried in order to prevent shrinkage. Hence the saying. And not only does Otterburn Mill have one of these old tenter frames, but it is actually the last surviving example of its kind in Europe. (Note: ‘tenter’ is from the Latin tendere, meaning ‘to stretch’). Otterburn Mill’s most famous retail item these days is undoubtedly the Royal Pram Rug. It all started back in the days of Queen Elizabeth II’s grandmother, Queen Alexandra, who, when visiting the region, was presented with a hand-made travelling rug from Otterburn Mill. The royals seem to have then developed a love for the locally-produced textile goods, and in 1926 Buckingham Palace lodged an order with the mill for a pram rug for a very young Princess Elizabeth, our present queen. The resultant tweed affair was duly despatched to the royal household, with a further dozen or so sold to the public via Fenwick department store in Newcastle. You can still get present-day versions of the royal baby covering via the Otterburn Mill shop or website.